I like to come up with new ways to eat more vegetables, because I our bodies really need it. I am not thinking cucumber, tomatoes and bell pebers, but the more fibrous ones like eg. brussel sprouts. I have read many places that brussel sprouts is a good diet food. After eating this salad last night, I believe part of the explanation is that you spend a long time chewing raw brussel sprouts, so it feels like you’ve eaten a lot of food after a good serving of this side. It’s more of an idea than a recipe, so you can adjust the size as you wish. I had the leftovers for lunch the next day and added manchego cheese. This really took the salad to the next level. Cut the ends off the brussel sprouts, peel the outer leaves off and slice finely. Either by hand (pictured) or in a food processor. Drizzle with 1-2 tbsps of olive oil or more depending on how much you make. Finish with juice from half a lemon or to taste. Season with salt & pepper. Let rest at least 15 min. Top with pistachio nuts and cheese (not pictured). 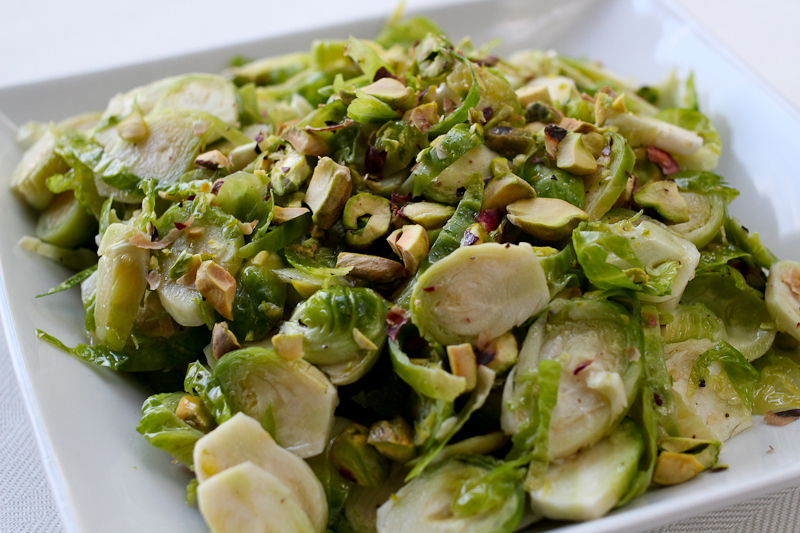 You will never fail by adding cranberries to brussel sprouts. This entry was posted in Salads & sides, Veggies only and tagged brussel sprouts, raw brussel sprout salad, rosenkål, salad with pistachio nuts, salat af rå rosenkål. Bookmark the permalink.